The following was originally posted at this time three years ago, but with some editing I decided to re-post because back then I think I had just a couple of readers! Have you ever had an excessive attraction to something and had a hard time letting go? I’m not talking about hard-core stuff like drugs and alcohol. I mean like chocolate, or TV, maybe a hobby like golf. I must admit I have dealt with my share of personal abuses throughout my adult life, principally smoking for decades until finally giving it up a little more than eleven years ago in favor of a healthier lifestyle. A compulsion, however which seems to annually trigger at this time of year is my fixation upon certain amenities used to embellish gift giving during the holiday season, that being, um, well it’s . . . wrapping paper and greeting cards. Shocking and embarrassing, yes I admit it. No, I haven’t shared this in Aberrational Holiday Behavior Group Therapy. I don’t know if there is such a group to address this particular psychological urge. Certain family members are aware of the situation, but prefer to snicker and shake their heads. My wife, the designated intervention specialist, instinctively grabs onto my coat as we walk past the displays at the Hallmark store or SuperTarget, tugging me away from certain temptation. I mean, it’s everywhere — even at the gas station! Yes, I know that to most people, gift wrap is . . . just gift wrap. 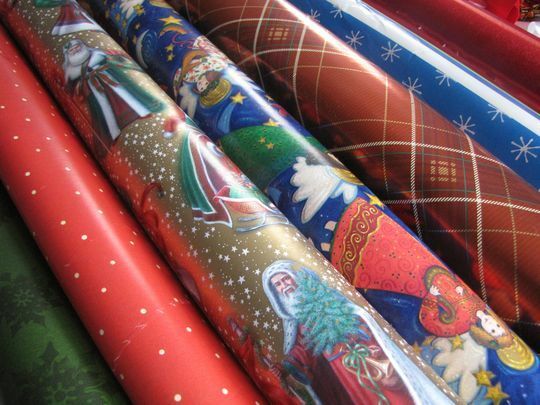 For weeks way before Christmas the shelves are loaded up and bins are full of wrapping paper rolls. Stuffed full with different lengths, metric and standard measurements. Cheap, easily torn paper and the expensive kind with lines on the inside so you know exactly where to cut; shiny foils, and some with sparkles in the designs. So attractive, it’s blatant Christmastime eye candy. And, almost irresistible. The issue is even more disturbing when I confess that we already have enough wrap on hand at home to wallpaper the entire house at least a couple of times. We have grownup wrap with designs both modern and old-fashioned. We have diagonal stripes, plaids and poinsettias and snowflakes ad infinitum. 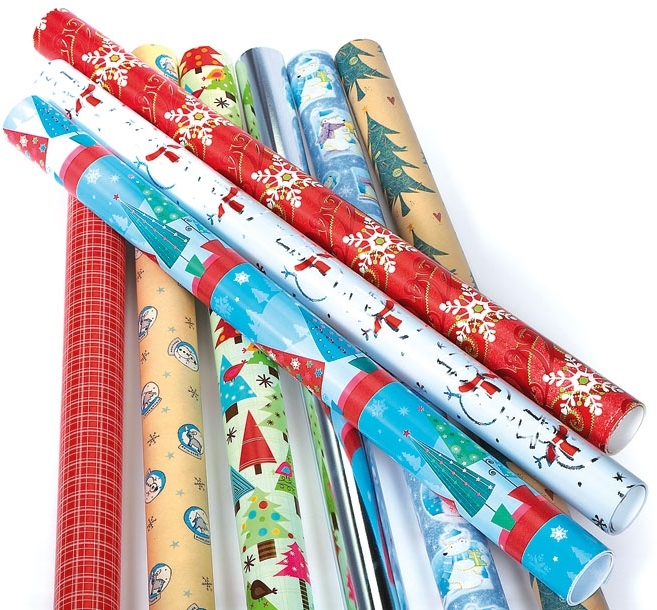 We have kid-specific wrap with Jolly Old St. Nick, wreath and tree pattern prints in festive colors, gingerbread men, candy canes and probably even sugar plums dancing off the sheets. Then there’s the greeting card isle. Box after box of gleaming, glittering options for expressing one’s best holiday wishes to anyone, or from anyone – even the cat. The scenes on the cards are so inviting, like the comfy home all aglow in the gently falling evening snow, lamppost decorated with ribbons and holly. A huge Christmas tree in the window, lit and adorned with treasured family ornaments. A happy snowman in the front yard, dressed up just like Frosty, and across the top, a warm-hearted message set in a fancy reflective gold metallic script. Oh! (hand on my chest) I’m gasping, and a bit choked up, I want to be in this Thomas Kinkade fantasy. I’ll take a dozen boxes. And each box usually has 12 to 18 cards with an appropriate number of envelopes plus one, because they know you’re going to mess up on at least one address. In reality, I don’t have more than a few friends and relatives to whom I might mail such a sentimental card. That along with increasingly outrageous postage rates is probably why I haven’t sent any out for years. I must say that I have done relatively well so far this year. I did nab a couple wrapping rol ls at the craft store last week, my wife not being on hand for restraint. They were 60% off. Who could resist? Just need to get through the next few days, then we can pack up the unused hoard and forget about it until next October, when holiday decor gradually begins to emerge restocked in the retail world and we can start all over again! PS: There is a problematic issue with Christmas candies and cookies too, but that’s a story for some other time. Merry Christmas and thank you for your eloquent words and your heart. Thanks for being you!